Throughout her life, Alexandra Stoddard has sought inspiration from writers, poets, and people she has met. 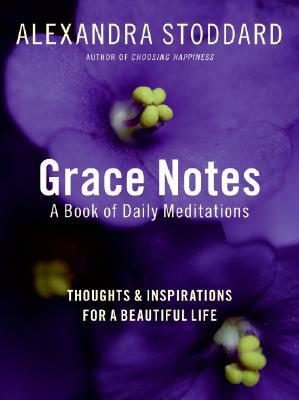 In Grace Notes, she shares this wisdom and her own learnings, beautifully captured in brief, motivating observations, in 365 daily meditations of warmth, affirmation, encouragement, and optimism. Season by season, day by day, you'll explore different themes: joy, love, loss, risk, courage, wholeness, growth, play, and success. In addition to offering inspirational quotes from many cultures and two "grace notes," each page provides space to write down your own sacred inspirations. With courage and confidence, Grace Notes takes you on a spiritual journey every day of your life—and whenever you feel the need to be transported to serenity and grace.